Admittedly, this seems like an out of the ordinary pizza, and I guess it is, but once you try it you will see just how delicious it can be. Making your own pizza at home is a pretty easy thing to do and costs a lot less than going to your local pizza place or getting delivery pizza, and you get to control the ingredients that go into it. You can make your own pizza dough, as I do often, or you can buy pre-made dough at most grocery stores and it is pretty inexpensive. This recipe is from Bon Appetit and is perfect for those who want a vegetarian pizza or those who like a pizza without any tomato sauce. Preheat the oven to 450 degrees. Heat 2 tablespoons of the olive oil in a large skillet over medium-high heat. Add the onion, season with salt and pepper and cook, stirring occasionally, until the onion has softened and turned golden, about 8 to 10 minutes. Add the Brussels sprouts, chopped garlic, and crushed red pepper flakes and cook until the Brussels sprouts are wilted, about 5 minutes. Season the mixture with salt and pepper, remove the skillet from the heat and set it aside. Lightly flour a rimmed baking sheet and stretch the pizza dough to the edges of the baking sheet. Lightly brush the dough with some olive oil and season the dough with kosher salt and freshly ground black pepper. Top the dough with 1/4 cup of the Parmesan cheese, then the Brussels sprouts mixture followed by the remaining 1/4 cup of Parmesan cheese. Bake the pizza until the dough is crisp and the cheese is melted, about 8 to 12 minutes. Allow the pizza to cool for 5 minutes before cutting. Serve the pizza drizzled with some more olive oil. I think this pizza had great flavor to it. 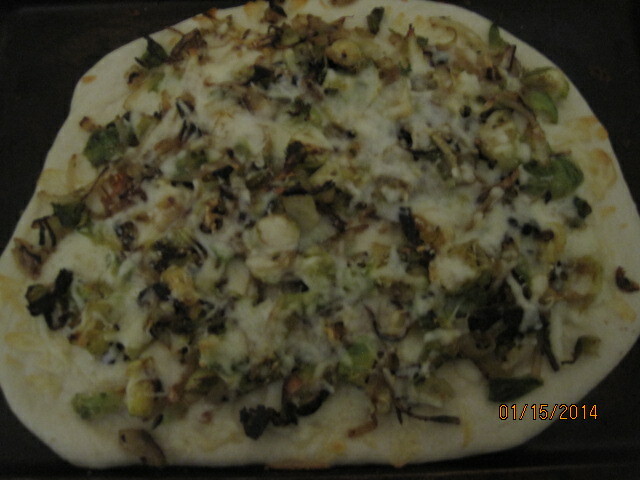 The Brussels sprouts and onions went together perfectly and the red pepper flakes just gave the whole pizza a hint of heat. You could always leave the crushed red pepper flakes out of the dish completely if you did not want any heat to it. I personally enjoyed it, but Michelle and Sean both said they would just as soon leave it out. I also made a plain cheese pizza to go along with this one and I am glad I did since there was none left of this particular pie. I was surprised Sean liked it so much since Brussels sprouts aren’t always high on everyone’s list, let alone a 13-year old, but he really liked it. I’ll definitely have to keep this one on hand because it is great to make if you need a vegetarian meal or just a pizza with no sauce. My dad ordered something similar to this at an Italian restaurant and it was amazing!! Such an interesting combination. It really is amazing. I loved the taste of it. I have never seen when we have gone out but I will definitely keep an eye out for it. Thanks for the comment Ani! My son was more than skeptical before I made it but we all loved it once it was done. Thanks for the comment Geraldine!